The RetroN 5 will have five cartridge slots as well as two controller ports for each system, allowing for users to use their original controllers. What will differentiate the Retron 5 from other iterations of retro consoles currently in the market are several key additions that add a modern twist. 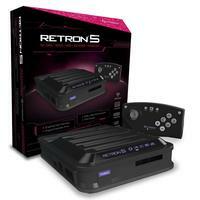 The RetroN 5 will have an HDMI output, which will allow for users to play their games on high-definition televisions. When users boot up the machine, they will find the "Perdana? digital user interface which opens a wide variety of modern gaming features such as selecting systems, button reassignment and other features that will be named at the Midwest Gaming Classic. The console will also allow users to play both NTSC and PAL cartridges and will incorporate Bluetooth technology, with a completely new, redesigned wireless Bluetooth controller. "We have had great success with the SupaBoy and RetroN 3, and we wanted to create an entirely new console that has the modern amenities that will allow users to utilize current technology,? stated Steven Mar, Hyperkin?s Executive Director. "As this is an ambitious project for Hyperkin, our goal for this system is to combine modern gaming convenience to not only cater to the ret ro gam ing com munity, but to also introduce a new generation of gamers to the classic games that have shaped the present gaming landscape. ?